Günther Prien, the man who was to become the commander of the famed U-boat U-47 and the Kriegsmarine's first recipient of the Knight's Cross during the Second World War, was born on 16 January 1908 in the town of Osterfeld in the state of Thuringia in central Germany, the son of a judge and the eldest of three children. Most of Prien's early childhood was spent in the northern port city of Lübeck, but this was to change following the break-up of his parents' marriage, which saw the young Günther and his mother move to the Saxon city of Leipzig along with his younger sister and brother Liselotte and Hans-Joachim. Life in Leipzig was far from easy, with Frau Prien making ends meet by buying and selling Erzgebirge lace; she made very little, with the meagre profits barely enough to feed the family. In order to earn a little extra money, the largest room in the house had been let to a student named Buzelius. Günther was employed as the errand and delivery boy, where more often then not he would be left to deal with the buyers, most of whom were prickly old women who treated him with an undisguised contempt. School did little for the young Prien; his great dream was to take to the high seas and follow in the footsteps of his hero, the great Portuguese seafarer Vasco de Gama, whose portrait sat above the youngster's bed. In 1923, buoyed by the support of his schoolfriend Heinz Frenkel and the ninety-one Swedish Kronor he had earned as a part-time guide at the Leipzig Trade Fair, Prien made the first concerted move towards a seafaring career he had yearned for so much. He was a mere fifteen years old. The headstrong young man's decision was against the wishes of his mother, but the young man was determined. Eventually, his mother gave him her blessing after Günther told her this was that he really wanted to do with his life. Arriving at the Seaman's College (Deutsche Seemannsschule) at Finkenwärder near Hamburg - dubbed the "matelot sausage machine" - Prien enrolled on a three-month training course, with the Swedish money just about covering the cost. The training at Finkenwärder under Captain Oelkers was tough and discipline was strict - but after the three months Prien and all of the others who had enrolled along with him passed the examination. Bereft of funds and unable to afford the fare for the journey home, Prien remained at Finkenwärder along with Jahnke, another graduate. This was to prove to be a lucky break, as not before long both he and Jahnke were offered places on the sailing ship Hamburg. After the boys had enquired about their wages, they were laughed at by Oelkers, who also went on to say that as the Hamburg was also a training vessel, both of them would have to stump up a further thirty Reichsmarks. The boys left disappointed, thinking perhaps that the opportunity had gone; however later that evening the captain summoned the two graduates to his office again, and informed them that the fees had been waived. After yet more cheeky questions about wages, Prien and Jahnke were provided with an outline of the pay structure - 'rising in small increments from zero Marks'. Prien soon found himself in the thick of things on board the Hamburg. During his first week he managed to get on the wrong side of one of the senior matelots, and was quickly made to understand how the hierarchy on board a merchant ship worked. His first assignment was to scrub up the latrine, popularly known as the "parliament", with only a supply of salt and a bucket of hot water. Although this was hardly the life he expected as a sailor, Prien laid into the task with gusto. He was to display the same level of commitment and bullish determination with all of the other tasks he undertook: time was spent honing his skills to a high level, skills that were later to become indispensable. As the months passed he found himself engaged in a wide variety of roles, including cabin boy, deckhand and even a short stint as a replacement cook. He excelled in all tasks, apart from a (in hindsight, at least) comical attempt to change the colour of white cabbage using red lead dye that was to lead to both a stomach upset for his crewmates and the ending of his short career in the kitchens. By serving on the Hamburg Prien had also fulfilled his dream to see beyond his homeland, with his journeys taking him to the Azores, Britain and across the Atlantic to America. In 1925 however disaster struck, when the Hamburg found itself caught up in a violent storm off the coast of Ireland. Swept like matchwood by the swirling winds and crashing waves, the ship was flung towards the coastline. It crashed violently, and if that were not bad enough Prien and a number of his colleagues found themselves involved in what amounted to face-to-face combat with an army of marauding rats. The local lifeboat was to arrive not a moment too soon. All of the Hamburg's crew were ferried to Dublin, and the following morning they forlornly attempted to salvage what they could from their stricken vessel. All attempts to get the ship serviceable again proved fruitless, and after six weeks the once-resplendent three-rigger was finally written off as a wreck. Having spent a less than eventful six weeks in the Irish capital, the indignity was piled upon the crew as they found themselves being shipped back to Germany as third-class passengers - as sailors without a ship. Prien's tale of woe did not end there; back in Hamburg at the company office expecting some sort of wage packet, he was duly informed by the clerk that he owed the ship's book five marks and seventy pfennigs for supplies he had drawn on board during his period of service. As if to clarify the situation the clerk handed Prien a receipt signed by his ex-skipper, an officious character who had rather unsurprisingly been dubbed der Schlangengrieper - 'the Old Sod'. On asking how he was expected to travel home, the official matter-of-factly stated that the company was prepared to foot the bill for a fourth-class rail ticket. Thanks to the intervention of his friends Stwer and Witaschek, the seriously annoyed Prien was prevented from boxing the pen-pusher's ears. He was to spend one last evening together on the town with his two shipmates - kindly funded by the pair of them - before bidding them both farewell. Things didn't turn out too badly for Prien however, as he soon found himself back in Hamburg having landed a job as an Offiziersanwärter on board the South America-bound freighter Pfalzburg, an ugly vessel that was a far cry from the three-masted full-rigger Hamburg. Once again Prien found himself having to get to know a completely new crew, some of whom didn't take too kindly to having on board the new boy who was training for his masters certificate. Prien was never as happy on board the Pfalzburg as he had been while serving on the Hamburg, but at least it kept him in the job and on course for the masters certificate. He even gained the grudging respect of the crew after he had stood up to Mayland, the bully who had plagued him right from his first day on board the freighter. All of this hardship was worth it however, as by early 1929 the twenty-one year old Prien soon found himself as the Fourth Officer on the passenger vessel San Francisco, his master's and wireless operator's certificates both safely in his pocket. His service was tough, but it was without its benefits. As well as gaining a wealth of seafaring knowledge and expertise, Prien had also been able to acquaint himself with many places around the world, imbibing a wealth of knowledge and experience far removed from his provincial early life running errands. 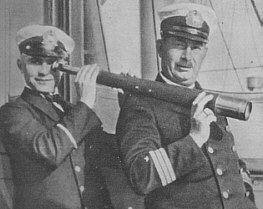 A twenty-one year old Günther Prien (at left) with First Officer Bussler, aboard the liner San Francisco in 1929. Both Prien and Bussler were to stand before the Marine Court following a collision and subsequent compaint from an irate passenger. When taking up his post on the San Francisco, donning his smart new uniform and taking command of his clean new cabin, it appeared that Prien was finally reaping the rewards after years of latrine-cleaning, deck-scrubbing and third-class travel. Yet ironically this was the period which saw an incident that almost put an end to his entire career. On 11 March 1929, the ship set out from Hamburg on a cold, grey evening en route to America. Not long into the journey, there followed a collision with another vessel, which Prien found out to be the steamer Karlsruhe. Following an outburst from an irate passenger, the Fourth Officer - Prien - was to effectively become the scapegoat. The damage was minor and had been calculated at 35,000 Reichsmarks, and the vessel was able to continue with its voyage. That no great harm was done was little consolation to the young Fourth Officer, who spent the remainder of the voyage brooding over the thought that everything he had worked for might come to nothing. The time soon came when Prien, the Captain and First Officer were summoned to attend the Marine Court - the Seeamt - in the port of Bremerhaven. After the three men had been given a thorough grilling by the Court Commissioner, the mood was not great, with everyone still unsure as to which way the verdict would go. After being called back into the court, the verdict was finally presented: it was the poor weather that had been the reason for the collision, and everyone else was absolved of blame. A great weight lifted from his shoulders, Prien decided there and then that he was going to double his efforts to obtain the coveted captain's certification. In January 1932, almost three years after the collision with the Karlsruhe, Prien had achieved his goal. One would have thought that a glittering Merchant career lay ahead, but this was not to be the case. 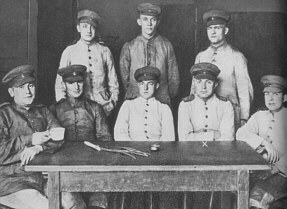 Left: Günther Prien (marked by an 'x') as a member of a volunteer work gang based at Burg Voigtsberg in the Vogtland, 1932. Right: Prien (again marked by an 'x') as a recruit with the Reichsmarine - later to become the Kriegsmarine, c. 1933. 1932 was to witness a number of changes in Prien's life, not least of all his merchant career. Like everything else in Germany at the time, the Merchant Marine found itself having to make substantial cutbacks. All of this meant that no sooner had he received his captain's certification, Prien found himself unemployed and on the scrapheap with the millions of others who had found themselves in the same situation. Deciding to stay on in Hamburg with the hope of finding a suitable job, the unemployed Merchant marine skipper found himself living off his savings, with much of his spare time spent reminiscing with Harry Stwer - his former bosun on board the Hamburg who now owned a bar on the Davidstrasse. After a brief flirtation with the thought of being an author by attempting to undertake the translation of Robert L. Gandt's China Clipper, the twenty-three year old Prien had decided to put his tail between his legs and go back home to Leipzig. It had been eight years. Prien's desperate attempts to secure a job in Leipzig proved to be no better than it had been back in Hamburg, and he soon found himself having to go to the local Mietskaserne, the equivalent of the unemployment benefits office. It was as if his entire world had been swiped from under him, and the feeling of despair just intensified as he saw the endless queues of miserable people filing past in front of him collecting a few miserable coins. It was this feeling of despair, a feeling shared by many other Germans, that led Prien to join the up and coming National Socialist party - in May 1932 be became member number 1,128,487. 1932 dragged on, and saw the unemployed Merchant Marine captain end up as a labourer in a succession of work-gangs in the Vogtland. Even there he made a good reputation for himself, and had been lined up as a potential leader. But Prien had always been a seaman; being a leader on a building site was not where he wanted to be. Things were not to remain this way for long, though - in late 1932 his life and career was to take another turn when heard the news that the Reichsmarine, the successor to the wartime Imperial Navy, had opened its doors to officers from the Merchant Marine. Prien grabbed this welcome opportunity with both hands, and headed off to the Baltic port of Stralsund to volunteer. This situation had come about rather fortuitously: on 26 July 1932 a freak summer storm had resulted in the sinking of the training sailing ship Niobe, killing seventy officer candidates of Crew 32. This led Admiral Raeder, Supreme Commander-in-Chief of the Reichsmarine, to write to Germany's leading commercial shipping lines asking for their best officers to come forward as replacements. One of the fifteen Handelsschiffsoffiziere (Merchant Marine officers) to join in 1933 was Günther Prien, who enlisted on 16 January. These men are often recorded as Crew 31/33; their previous experience earned them a place in Crew 31. By the end of January 1933, Günther Prien was back in uniform again, having been admitted to the Reichsmarine at the rank of ordinary seaman. On 30 January, one Adolf Hitler became Chancellor of the German Reich.